A book and film club for avid readers and Deptford cinephiles. Every second Sunday afternoon of the month, we will meet up to watch a film adaptation of a book or a writer’s biopic. In December, we will discuss the screen adaptation of Truman Capote’s novella Breakfast at Tiffany’s. A charming comedy that highlights the life of Holly Golightly and questions the traditional postwar role of women, showing their search for a new, self-determined identity. Holly is an eccentric socialite living with her cat in the same Manhattan apartment block as aspiring young author Paul Varjak (Peppard). The restlessness and superficiality of New York life proves unsatisfactory to both. The opening early morning sequence of Holly on Fifth Avenue in New York City, wearing sunglasses and having breakfast in front of Tiffany’s turned Audrey Hepburn into an icon of style. Composer Henry Mancini won an Academy Award for Best Song “Moon River” and for Original Music Score. The novella's exquisite prose style prompted Norman Mailer to call Capote "the most perfect writer of my generation" adding that he "would not have changed two words in Breakfast at Tiffany's". 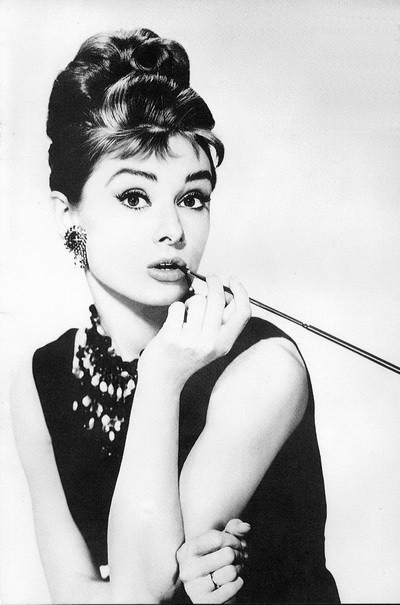 Audrey Hepburn, icon of style.